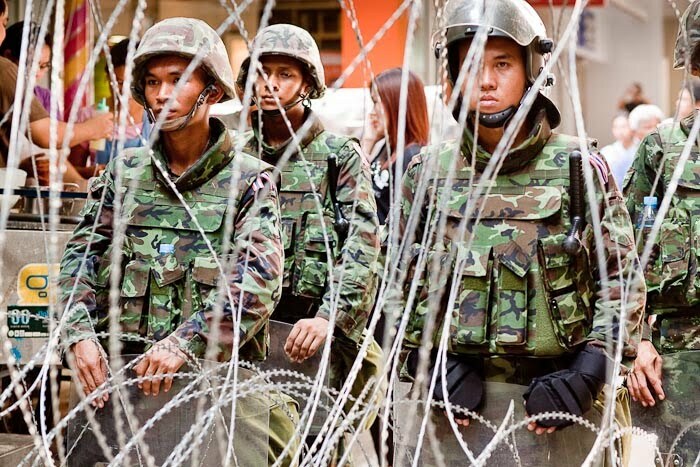 Thai soldiers stand behind a wall of razor wire on Silom Rd in Bangkok Monday. Silom is the heart of Thailand’s financial services industry - the Wall Street of Thailand as it were. The government has not been able to dislodge the Red Shirts from Ratchaprasong Intersection, the heart of Thailand’s retail industry, so they hope to prevent a similar problem in Silom by preventing the Red Shirts from ever getting there. The soldiers were brought in early this morning. They put up barricades in Sala Daeng intersection to prevent the Reds from driving their trucks into Silom and the area was flooded with thousands of soldiers. Workers in the area, most of who don’t support the Reds, greeted the soldiers as conquering heros and brought them food and water. Spontaneous patriotic demonstrations broke out along Silom Rd. The Thai government has said now that they will rely more on the soldiers to control the crowds and relegate the police to a support role. The soldiers seem to be better equipped. This morning they were armed with a mix of assault rifles and shotguns. At previous demonstrations the police have been unarmed or had handguns only. The Red Shirts have said off and on for the last couple of weeks that they may move into Silom. Today they said that after thinking about it, maybe they won’t move after all. So now the question for Thai leaders is “do the Red Shirts mean it?” That’s a question only the Reds’ leaders can answer. There are more photos from the Army in Silom in my PhotoShelter archive and available from ZUMA Press.